Albert Einstein’s autograph has been sought after and valued since his lifetime. The most famous scientist of the 20th Century, Einstein had a prominent place in the public awareness because of theories the general public couldn’t comprehend, but found fascinating and intriguing. 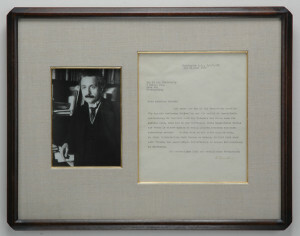 Public interest caused people to make Albert Einstein’s signature desirable and treasured. Einstein like many other extraordinarily brilliant scientists began as a mediocre student in Switzerland. He was unable to secure a teaching position and took a low level job in the Swiss Patent Office. In his spare time he worked on his doctorate which he received in 1905, the same year he published four ground-breaking papers including his Theory of Special Relativity. In 1909 he quit the patent office to take the position of physics professor at the University of Zurich. His Theory of General Relativity was published in 1911 and its predictions made him internationally famous. Many of these theories were only recently proven to be correct when instruments on spaceships were able to test them. He was the most famous scientist in the world, but Albert Einstein’s autograph was not common. He toured the world giving lectures to scientific groups, but the fascinated general public had little access to ask for his signature. It was on a trip to the United States, in 1933, that he learned that Nazi Germany would not allow him to return and he stayed in the United States permanently, becoming a citizen in 1940. Albert Einstein’s signed letters were preserved and treasured by the recipients. Einstein’s signed letters are normally in his native German and frequently have interesting content. Jewish affairs were of great concern to Einstein and many of Albert Einstein’s signed letters express his great interest and concern for Jewish refugees in the 1930’s and 1940’s and many of Einstein’s signed letters are arranging help for them. Albert Einstein’s most famous letter was written to Franklin D. Roosevelt in August 1939 telling him of the likelihood that research could result in the atomic bomb. He warned that Nazi Germany was actively pursuing research on splitting the atom. Einstein had been asked by scientists working in the United States to approach Roosevelt because Einstein’s name would give great weight to their concern about Germany’s progress. The resulting Manhattan Project led to the development of the atomic bomb dropped on Japan. Albert Einstein signed letters concerning the atomic bomb are extremely rare and those discussing the peaceful use of atomic energy are almost always form letters bearing very convincing but printed signatures. All Albert Einstein autographs, signatures, signed letters and signed memorabilia that we offer for sale are unconditionally guaranteed genuine. Our guarantee is backed up by over 50 years expertise and authorship of the standard reference book Forging History, The Detection of Fake Letters and Documents. Please browse our selection of Albert Einstein autographs or you may search our entire inventory alphabetically, by name, or by category.